Are You Living in the Leadership Loop? Leaders, by definition (if not practice) have followers. Leaders find, recruit, and train followers for specific tasks. While this is an important task in any organization, a leader who can only lead followers is limited. To make it to the next level of leadership, a leader must be able to lead other leaders – those alongside them. Leading peers is a unique challenge, no matter what organization a leader is part of. A highly competent leader who is seen – rightly or wrongly – to have considerable influence with his boss is often at a disadvantage when it comes to peer-to-peer relationships. To succeed at leading alongside your peers, you must work at giving your colleagues reasons to respect and follow you. You do that by helping them win, and in doing so, you will not only help your organization but you will also help yourself. Don’t wait for that promotion! Start leading NOW…right where you are! What’s the number one question leadership expert John C. Maxwell is asked while conducting his leadership conferences? “How can I implement what you teach when I’m not the top leader?” Is it possible to lead well when you’re not the top dog? How about if the person you work for is a bad leader? The answer is a resounding yes! Welcome to The 360° Leader. People who desire to lead from the middle of organizations face unique challenges. And they are often held back by myths that prevent them from developing their influence. Dr. Maxwell, one of the globe’s most trusted leadership mentors, debunks the myths, shows you how to overcome the challenges, and teaches you the skills you need to become a 360° leader. If you have found yourself trying to lead from the middle of the organization, as the vast majority of professionals do, then you need Maxwell’s insights. You have a unique opportunity to exercise influence in all directions—up (to the boss), across (among your peers), and down (to those you lead). The good news is that your influence is greater than you know. Practice the disciplines of 360° leadership and the opportunities will be endless . . . for your organization, for your career, and for your life. The middle of an organization is a great place to practice and build your skills while at the same time extending your influence in all directions. Leaders above you recognize your contributions to the greater organization. Followers below you are grateful for your leadership and influence in developing them. However, people who find it difficult to lead alongside their peers are often individuals who don’t excel at building relationships. More so than leading up or down, developing and deepening relationships with your peers is critical to your success in leading alongside them. If you want to gain influence and credibility with people working alongside you, then don’t try to take a shortcut or cheat the process. Instead, learn to understand, practice, and complete the leadership loop with them. 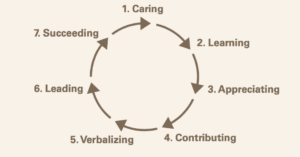 You can see that it’s a cycle that starts with caring and ends with succeeding. You have to show people that you care about them by taking an interest in them. People always move toward someone who increases them and away from anyone who decreased them. Take time to talk to your peers in the organization. Ask to hear their stories. Try to discover their best skills. Ask for their opinions on work-related issues. And as much as you can, try to put yourself in their shoes. We should strive to see others’ unique experiences and skills as a resource and try to learn from them. If you treat your peers with this kind of respect, appreciating them for who they are, then they will be more likely to respect and listen to you in return. Few things increase the credibility of leader ore than adding value to the people around them. When you go out of your way to add value to your peers, they understand that you really want them to when with no hidden agenda of your own. Few things build people up like affirmation. When you affirm people, you make firm within them the things you see about them. If you want to influence your peers, become their best cheerleader. The things you’ve done up to know have served to build your relationship with them, give you credibility, and display that your motives are good. With that kind of history, you will have earned the opportunity to influence them. Great leaders don’t use people so that they can win. They lead people so that they all can win together. The wonderful thing about helping others succeed is that it earns you more opportunities to help an even greater number of people. If you help others succeed, additional people will come into your life whom you will have an opportunity to help succeed, and the cycle will start over again. Draw the leadership loop pictured above, and post it in a visible, but out-of-the-way place in your office or work area as a reminder. Create a matrix on a spreadsheet listing your peer’s names in a horizontal column, and the seven leadership loop actions in a horizontal row across the top. Over the next month, review the seven actions above on a daily basis, and intentionally schedule and follow through on these actions each day with your peers. At the end of each day, make a brief note in the respective place what action you have taken with each of your peers. At the end of the week, review your progress, and consider how you will continue and improve in the next week. At the end of the month, call your team together and debrief your experiment with them. Ask them at what point they realized you were doing something differently. Ask them what they thought about your actions. Encourage them to express what it felt to them as an individual. Ask them if they, in turn, began to do some of the same things with others. Discuss with the group how the actions you took increased the relationships of the team. Challenge your peers to work through the leadership loop in a similar manner. Excerpt taken from SUMS Remix 79-2, issued November 2017.